The latest installment of the American International Group (AIG) “Bailout” is not the good news that one might imagine from reading AIG’s press release. It does not provide as much financing as originally anticipated. More importantly, it is a reminder that, so far, the U.S. government has done much more to minimize losses for AIG’s counterparties than to maximize value for AIG. Edward M. Liddy, AIG Chairman and Chief Executive Officer, said: “AIG’s highest priority is the full repayment of the federal loan facility with interest. The creation and launch of this financing entity will eliminate the liquidity issues associated with AIG’s U.S. securities lending program, which will facilitate our repayment plan. Although we have more work ahead of us, this is an important step forward. We appreciate the support of the Federal Reserve Bank of New York in implementing this transaction.” This seems to imply that this ‘financing entity’ is a new development that frees up AIG capital that otherwise would have gone to satisfy securities lending payables. While the transaction is a means of financing AIG’s securities lending payables, it is part of the bailout plan and does not provide any capital beyond that anticipated in the bailout. In fact, it provides somewhat less. The illustration in AIG’s November 10th 10-Q1 filing shows a purchase price of $23.5 billion, based on fair market values on September 30th. The actual transaction was based on lower values as of October 31st, and the purchase price was $19.8 billion instead of $23.5 billion. In my previous analysis, I assumed, based on the 10-Q disclosure, that $23.5 billion would cover substantially all of the securities lending payables, and the financing would provide $22.5 billion, leaving $1 billion to be paid by AIG. In the final deal, these payables required $24.9 billion – the $19.8 billion of sale proceeds plus a $5.1 billion capital contribution from AIG. In other words, the final deal required an additional $4.1 billion from AIG. The real bad news here is not that the value of these RMBS securities fell by $3.7 billion, or 15.7%, in one month; nor is it that AIG had to contribute $4.1 billion more to wind down its securities lending business. The bad news is that until the deal was finalized, the NY Fed had the ability to make it a more effective tool for saving AIG, and now that chance is gone. The NY Fed has purchased a portfolio of mortgage-backed securities for 50 cents on the dollar. This price is more reflective of the lack of liquidity in the market than default rates. It is likely that a price of around 80% of par would have more closely approximated the ultimate recovery if the securities were held to maturity.2 The NY Fed’s agreement to share a small portion3 of the gains with AIG after its loan to Maiden Lane II is repaid does little to help things today. This should turn out to be a nice investment for taxpayers. While some of the legal details have yet to be ironed out, it is clear that the U.S. government controls AIG. The U.S. government can choose to maximize the long-term value of AIG’s most important assets – its reputation and its people – or it can focus on the salvage value of its financial assets. Its actions to date indicate that it is focused more on the latter than the former. So far, the U.S. government has made sure that banks, investment banks and other parties to AIG’s credit default swaps and securities lending agreements are made whole, even though these parties do not have the most senior rights as creditors. Now that a partial list of the beneficiaries of these transactions has been made public, it is becoming clear that if these institutions had been forced to bear some loss as part of a negotiated deal outside of bankruptcy, the financial system would not have buckled. The U.S. government made a policy decision to help certain members of the financial system that had transacted business with AIG, and has handed the bill to AIG. Whether or not the policy decison is justified, forcing AIG to bear the entire cost is not. Nearly all of the $170+ billion bailout has gone to fund losses on securities that are no longer on AIG’s balance sheet and have nothing to do with AIG’s go-forward business, so nearly all of the bailout funding arguably should have been funded off-balance sheet. Instead, only about $50 billion is being funded off-balance sheet through Maiden Lanes II and III. As a result, AIG is saddled with over $270 billion of debt and high dividend preferred stock, compared to under $150 billion in 2006. As I explained in my analysis last week, the $270 billion needs to come down to around $120 billion before AIG’s balance sheet will truly be stabilized, and deserving of its ratings. The plan is to achieve this through asset sales, but this is fallacy. The current value of the assets targeted for sale is probably less than half of the amount needed. Besides, the operating income from the targeted businesses4 may represent nearly half of AIG’s total normalized operating income, so if they were sold, the amount of debt that the remaining businesses could support would be far less than $120 billion. AIG can limp along on “life support” for several years, since interest and dividends on $100 billion of the financing can just accrue instead of being paid in cash, but this just adds to the bill down the road. The industry and AIG’s employees know that AIG’s current situation is not sustainable, and it is starting to show. AIG disclosed in its 10-Q that its business is being negatively impacted by its financial instability. And the company’s loss of senior executive Kevin Kelly to a competitor last week is just one example of what will happen to AIG’s executive ranks if things are not stabilized soon. It is not clear if the U.S. Government cares about this, or if the intent is to break up the business, run-off the assets, and hope to recover at least the debt portion of the bailout funds. It is not too late to choose the growth strategy over the wind-down strategy, but if growth is indeed the goal, the current course must change quickly. 1 Please see the “Subsequent Events” section of AIG’s Q3 form 10-Q filed on November 10, 2008 (page 45). 2 As of September 30th, AIG’s RMBS included $14 billion each of Alt-A and subprime loans (the bulk of the rest was Agency and Prime). In October, 18.2% of all U.S. subprime loans were in foreclosure or REO, and another 10.4% were 90+ days past due (download data). Of all Alt-A loans, 9.3% were in foreclosure or REO and 4.8% were 90+ days past due (download data). Assuming that all of these end up in default and that the net recovery is zero, the total loss averages 21.3% between the Alt-A and subprime. The bulk of the RMBS were rated AAA, so they probably had about 10% subordination below them. Thus, assuming the securities sold to the NY Fed were evenly divided between Alt-A and subprime, the loss would be roughly (21.3%-10%)/90%, or 12.6%. This implies that a price of about 85% of par, or perhaps as low as 80% to allow a cushion, would have been a reasonable figure for the NY Fed to pay if the goal were to maximize the support of AIG while minimizing the loss to taxpayers. Instead, the NY Fed took advantage of the current dysfunction in the capital markets to buy the RMBS at a low price (for a scholarly article on how current market prices for mortgage-backed securities are below fundamental values, click here). 3 After the NY Fed loan is repaid, the first $1 billion (plus interest) of gains is paid to AIG subsidiaries, then the remainder is split 5/6 to the NY Fed and 1/6 to AIG subsidiaries. 4 Please see “Segment Information” on page 149 of AIG’s 2007 form 10-K for the operating income of AIG’s Life and Retirement Services businesses and aircraft leasing business. AIG could hardly support its pre-bailout debt, let alone an additional $115 billion of debt and dividend-bearing preferred stock. For AIG’s balance sheet to be healthy again, leverage needs to come down by approximately $150 billion. It appears unlikely that this can be achieved through asset sales. AIG needs more immediate attention, and the company’s franchise value erodes each day that a permanent fix is delayed. The analysis below shows that AIG’s balance sheet was over-leveraged before the bailout, so the additional debt and preferred stock just compounds the problem. The leverage piled onto AIG’s balance sheet, primarily to satisfy parties to its CDS and securities lending agreements, needs to be restructured again. AIG’s liquidity crisis became critical when rating agencies lowered AIG’s ratings by several notches last September, which triggered collateral calls on certain CDS contracts. If AIG did not post required collateral, counterparties to the CDS agreements could terminate them, requiring AIG to come up with the full “notional”2 amount of the CDSs. Termination payments would have been nearly twice as large as the collateral requirements. The Fed credit facility enabled AIG to meet its collateral calls and avoid terminations. Through November 5th, AIG had posted or agreed to post collateral totaling $39.9 billion with respect to credit default swaps. This is a huge windfall for the holders of these CDOs,7 which go from owning extremely illiquid securities carried on their balance sheets at pennies on the dollar, to getting cashed out at or near par (through the combination of the market purchase of the CDOs and the CDS collateral and termination payments). Prior to the initial Fed/Treasury bailout, these parties could have threatened to put AIG into bankruptcy if AIG did not post the required additional collateral, but in reality their negotiating leverage was limited. The collateral they held was only a fraction of the amount owed to them if the CDS agreements were terminated, and their unique status in bankruptcy as parties to “financial transactions” only gave them the ability to keep the collateral they had. Their additional claims would likely have been treated like any other prepetition unsecured claims.8 Despite their questionable seniority, they are being made whole. There are probably some senior secured creditors of AIG that wish they got the same deal…. While it is difficult to calculate precisely how much debt AIG’s operations can support, the analysis below provides an approximation. One can get a sense of AIG’s potential normalized revenue and operating profits, and the debt that can be supported by those profits, by going back to 2006, when the performance of AIG’s Financial Products group had little impact on the business. Below is a summary of relevant 2006 financial data. 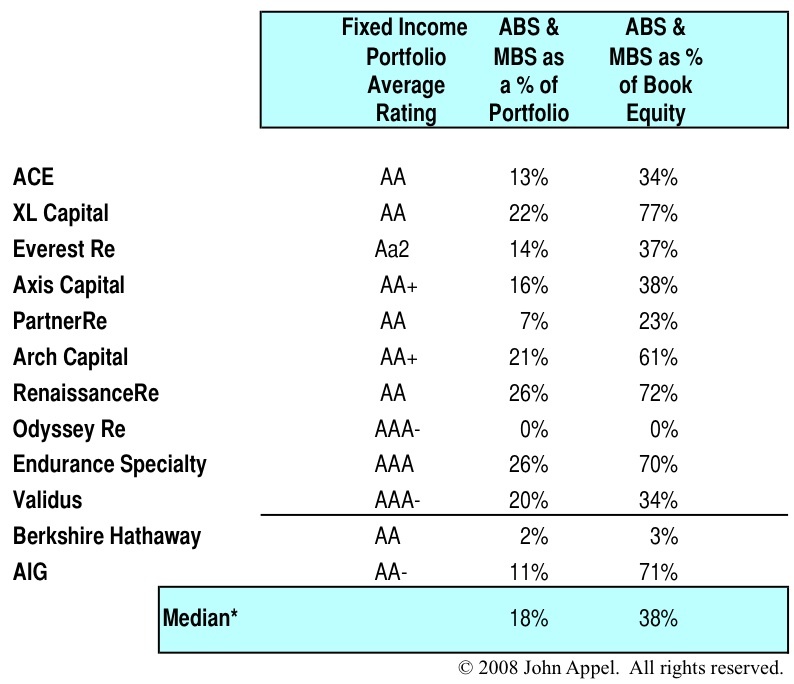 The table shows that 2006 was a banner year for AIG. With low losses and high investment returns, earnings before interest, taxes and minority interest (EBITM) was 25% of revenue, and the company had a 15% return on adjusted equity. Debt amounted to about 5x EBITM and interest coverage (EBITM/Interest) was about 4x. Presumably this was the type of leverage multiple and interest coverage that was necessary to maintain its ratings. The table below compares 2008 to 2006. For 2008, the table shows actual results for the year-to-date ended 9/30/08, annualized YTD 2008 results, and pro forma normalized results with and without the bailout. One can see in the third column that AIG was over-leveraged before the bailout, with debt of nearly 8x normalized EBITM. More debt and preferred stock was the last thing AIG needed. The bailout leaves AIG leveraged at over 13x normalized EBITM, with interest coverage of only 1.5x. To bring its leverage and capital ratios back to 2006 levels, it appears that AIG needs to reduce its debt and preferred stock by $150 billion (the difference between what is shown in the fourth and fifth columns). AIG and the architects of the bailout knew that the structure was not a permanent fix, but anticipated that sufficient assets could be sold to repay the U.S. government funding and achieve the deleveraging needed to stabilize the balance sheet. The main assets identified for sale are the aircraft leasing business (ILFC) and the life insurance operations. I estimate the book value of ILFC at approximately $10 billion.9 With approximately $1 billion in operating income, ILFC would probably sell for about 1x book value in a normal economic environment, but in the current environment, I would not be surprised if the number is half this amount. I estimate the unlevered book value of the Life Insurance and Retirement Services business at roughly $135 billion.10 Given that operating income for this segment is in the range of $8-10 billion, it is hard to imagine even the most strategic buyers paying 1x book. A more realistic figure today might be closer to $80 billion (about 1.5x revenue and a high single-digit multiple of operating income). Whether these assets are sold in the near term, for proceeds perhaps in the range of $80-90 billion, or a few years from now for something closer to $150 billion, it will not be enough to fix AIG’s balance sheet. While debt would be reduced, operating cash flow to service debt would be reduced as well, so the remaining business would still be over-leveraged. AIG attempted to raise capital in the private sector, enlisting the help of Blackstone, J.P. Morgan, and Goldman Sachs. The company spoke to private equity funds, sovereign wealth funds and other potential investors. J.P. Morgan and Goldman tried to syndicate a $75 billion lending facility – but all of these attempts failed. AIG summarizes this whole saga here. Given the state of AIG’s balance sheet, the unknown (and perhaps unknowable) risks in its investment portfolio, litigation risks from disgruntled shareholders and others, and many other factors, it is likely that the private sector would have required AIG to reorganize through Chapter 11. The company’s total obligations were just too big to be met from present or foreseeable cash flows of the business. If it is in the best interest of the global financial system for AIG not to go through Chapter 11, then the U.S. government should help engineer an alternate way to remediate AIG’s balance sheet permanently, not just plug a short-term liquidity gap by adding even more debt and dividend-bearing preferred stock. AIG sell (at net book value) businesses with expected net asset values of over $50 billion to an entity jointly owned by AIG and the NY Fed or Treasury in return for a cash payment to AIG of $50 billion. The sum of these actions would reduce AIG’s net debt and dividend-bearing preferred stock by an aggregate of $150 billion; increase book equity by perhaps $30 billion; and enable the complete pay-down and termination of the Fed credit facility. AIG would have a healthy balance sheet immediately and could refocus on building its businesses and shareholder value. Taxpayers would ultimately be paid back through the CDO and RMBS pools, the orderly sale of business assets, and the eventual conversion and sale of the new preferred stock. There are many other approaches one could use to achieve similar results, but one way or another, the current Fed/Treasury deals need to be restructured. 1 Below is a more detailed summary of the revised agreements with the Fed and Treasury. For an even more complete description, please see footnote 11 to AIG’s Q3 financial statements (“Subsequent Events” – beginning on page 43). Certain AIG subsidiaries entered into a securities lending agreement with the NY Fed, through which the NY Fed provided liquidity to AIG by borrowing, and posting cash collateral for, $19.9 billion of securities. Since then, AIG and the NY Fed have formed a special purpose entity, Maiden Lane II LLC, to buy $40 billion face amount of RMBS from AIG subsidiaries for $23.5 billion in connection with the termination of AIG’s U.S. securities lending operations. The NY Fed will be repaid the $19.9 billion of collateral with a portion of the proceeds. The NY Fed agreed to lend up to $30 billion to a special purpose entity, Maiden Lane III LLC, formed to purchase (on market terms) the CDOs underlying most of the credit default swaps written on “super senior” multi-sector CDOs. Affiliates of AIG were given access to the NY Fed commercial paper program, through which $15.2 billion had been borrowed as of November 5th to enable AIG to pay down borrowings under the Fed credit facility to $61 billion from $77 billion. The U.S. Treasury invested $40 billion in Series D preferred stock with a 10% dividend rate. The U.S. Treasury was given warrants for 2% of AIG’s common equity. Terms of the Series C convertible preferred stock provided to the Treasury in connection with the Fed credit facility were modified so that it is convertible into 77.9% of the common shares instead of 79.9%. The Fed credit facility was reduced from $85 billion to $60 billion, and the interest rate was reduced to LIBOR plus 3%. 2The “notional amount” is the face amount of reference securities on which the credit default swap is written. 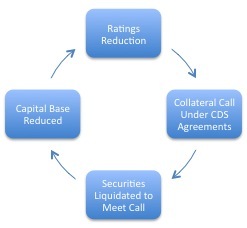 4 Most of these agreements also require physical settlement, meaning that instead of a cash settlement equal to the difference between the notional amount of the CDS and the “exposure” on the settlement date, the agreements require AIG to deliver the full notional amount of the CDS in return for delivery of the underlying securities. 5 The multi-sector CDOs were comprised of prime RMBS (11.3%), Alt-A RMBS (15.8%), subprime RMBS (37.1%), CMBS (21.5%), CDOs (9.4%), and other (4.9%) [Note: CDO percentage corrected 1-6-09]. 6 As of November 25th, $46.1 billion of CDOs had been purchased and a corresponding notional amount of CDS agreements terminated, with the remaining $18.6 billion in process (See Form 8-K for more details). 7These CDO/CDS holders include Société Générale, Goldman Sachs, Deutsche Bank, Crédit Agricole, and Merrill Lynch (Source: WSJ). 8 Changes to the Bankruptcy Code in 2005 and 2006 expanded the rights of CDS counterparties in a bankruptcy, but the main effect was to enable these parties to enforce termination provisions and collect collateral. Any claims not satisfied by the collateral are still treated as prepetition claims (11 U.S.C. § 502(g)(2)). 9 $45 billion of identifiable assets as of 9/30/08 less $35 billion of ILFC debt leaves $10 billion of net assets. There are probably other operating liabilities of ILFC, so the actual book value is likely to be lower. 10 Identifiable assets of $615 billion as of 12/31/07 per 10-K, less $30 billion change in invested assets as of 9/30/08, less $450 billion reserves, contract deposits, DAC/VOBA & SIA leaves $135 billion of net assets excluding debt. As with ILFC, the actual book value is likely to be lower. Catastrophes both natural and man-made have been hitting reinsurance companies, but the outlook is good. Shares of all the reinsurance companies were pummeled in October, with the combination of Hurricanes Ike and Gustav hitting underwriting profits while the capital markets carved a mark-to-market chunk out of investment portfolios. Things seemed to improve around Halloween and into November, as signs of “hardening” premium rates began to emerge. But shares have recently retested their lows as the dysfunctional capital markets – especially for mortgage- and asset-backed securities – overshadow improving fundamentals for the group. This has created opportunity for the intrepid value investor. * Does not include AIG, BRK, and XL. Table 1 lists these companies in order of total capital, along with relevant market value multiples, some key performance metrics, and my per-share valuation of each company based on fundamental analysis (except for AIG (AIG) and Berkshire Hathaway (BRK-A), which I include for comparison but don’t value). Table 2 provides information on their investment portfolio quality. 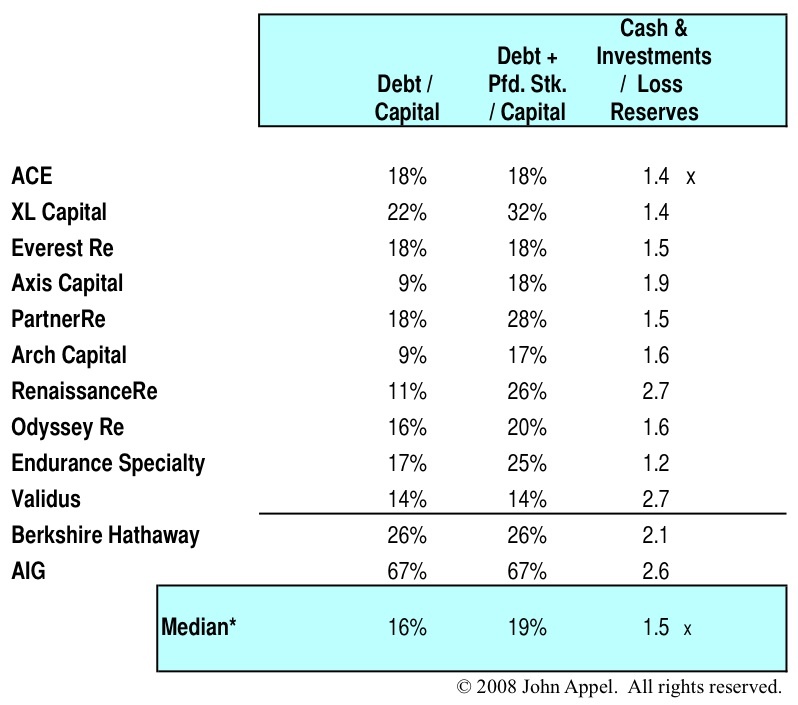 Table 3 shows debt-to-capital ratios and a ratio I use a rough indication of capital adequacy: the ratio of cash and investments to loss reserves. * Medians exclude Berkshire Hathaway and AIG. See endnotes for an explanation of terms and calculations. ACE Limited, founded in 1985, is a Zurich-based leading global property & casualty, life, and accident & health insurance company and reinsurance company with operations in more than 50 countries. Its ACE Tempest reinsurance operations are well respected but comprise less than 10% of ACE’s consolidated net written premiums. Reinsurance net written premiums are down over 22% YTD, but its prospects for growth are good, as ACE has the scale and reputation to capture significant business from AIG at January renewals. ACE has the best YTD combined ratio of the group. The quality of its fixed income portfolio is about average for the group, and its make-up and duration are consistent with its insurance business mix. As of 9/30, ACE had $5.5 billion of asset-backed securities (“ABS“) and non-agency mortgage-backed securities (“MBS“) in its portfolio, including $2.3 billion of commercial mortgage-backed securities (“CMBS“). Given that spreads have recently skyrocketed for these securities (see chart, below), ACE is likely to report more unrealized investment losses in the fourth quarter (a 100 basis point yield increase equates to a +/-350 bp price reduction on a portfolio with a 3.8 year duration, or over $1 billion on ACE’s $36 billion fixed income portfolio). These unrealized losses should have little real impact because ACE should not need to sell its structured securities (at least not in this market), but it seems that investors need little incentive to punish a stock these days, so value investors should see further buying opportunities. Axis Capital is a Bermuda-based specialty P&C insurer and reinsurer, founded in November 2001. Reinsurance is the majority of its business. Property, professional lines and catastrophe are its largest business lines, representing 26%, 21% and 16% of gross premiums written. These businesses should all see firming rates in 2009. Its fixed income portfolio is higher rated on average than most at AA+ and the average duration is shorter than most at 2.9 years. It includes $1.7 billion of ABS and non-agency MBS (including $860MM CMBS). The relatively short portfolio duration means that an increase in credit spreads not only will have less effect, but also is more likely to be offset by yield curve changes. One potential portfolio risk is the $636 million of hedge funds, credit funds and CLO equity tranches, for which marks vs. cost are not disclosed. However this exposure is only 13% of book value. AXS is very well capitalized relative to its current book of business, and its debt-to-capital is the lowest of the group at only 9%, so the company is quite well positioned to grow. S&P gives it an “A” rating but a “positive” outlook – the only “positive” for the group. Its management team is strong and seasoned, and its level of capitalization and other metrics are more representative of an A+ company, so it is likely that its relatively short operating history has been the only thing holding it back from an A+. PartnerRe, based in Bermuda, was founded in 1993 and is the 10th largest global reinsurer, with lines of business that are well diversified by risk category and geography. Premium growth YTD was driven by opportunistic business in the agriculture sector; other lines of business declined consistent with the group (when adjusted for one-time items). A principal reason for the decline was greater risk retention by ceding insurers. With insurer balance sheets constrained and little ability to reload in the current capital markets environment, risk retention by primary insurers is less likely to impact growth in the next year or two. The company is well positioned with its “AA-” S&P rating. PRE’s combined ratio was an attractive 91.4% despite hurricane losses in Q3, which speaks to the company’s underwriting discipline and ability to generate profitable growth. PRE’s investment portfolio has only $825MM of ABS and non-agency MBS, although widening credit spreads on its $1.3 billion of finance sector corporate bonds (banks – $600MM) will also have an impact. Unrealized losses will hit earnings, not just comprehensive income, because PRE elected “fair value” treatment under FAS 159 this year (ACE, AXS, VR and XL continue to flow unrealized losses through comprehensive income, except that ACE made the FAS 159 election for its equity securities). Validus Holdings, based in Bermuda, was formed in December 2005. Through Validus Re, it is a leading writer of property catastrophe insurance and also writes marine, energy and other specialty, short-tail lines. VR writes direct insurance through Lloyds syndicate member Talbot, which it acquired last year. VR was initially capitalized by private equity groups Aquiline Capital, Vestar Capital Partners, New Mountain Capital, and private equity affiliates of Goldman Sachs and Merrill Lynch. The company went public in July 2007. VR is very well capitalized for the size of its current business, with cash and investments of 2.7x loss reserves, and debt-to-capital of only 13.7%. Its “A-” rating from A.M. Best is typical for the Bermuda “Class of 2005” and more indicative of its limited track record than its financial health and operations. Its combined ratio YTD is still 93% even after Ike and Gustav took it up to 122% in Q3. ABS and non-agency MBS of $653MM is 34% of book value but the average rating for the total portfolio is “AAA-” and the duration is a low 2.2, which is consistent with its short-tail focus and should provide some cushion against widening credit spreads. Growth was flat last year (pro forma for Talbot) but VR is very well positioned to grow next year. XL Capital, based in Bermuda and founded in 1986, is a diversified P&C insurance, life insurance and reinsurance company with 77 offices in 27 countries. Its reinsurance businesses are ranked among the 12th largest globally. XL’s situation shows how confidence is much easier lost than regained, and is a good example of how, in today’s environment, investors sell first and ask questions later. XL’s price/book multiple is lower than AIG’s, and from its stock price trajectory, one would think that XL was headed for the same explosive fate, but without a bailout. However, XL’s current operating performance, and even the rating agencies that give XL a “negative” outlook, paint a much more positive picture. The rating agencies say XL has “strong” capital adequacy. XL’s debt-to-capital ratios in Table 3 do not reflect that $745MM of debt converts to equity on 2/11/09. On a pro forma basis, debt/capital and debt+pfd/capital are a very reasonable at 17% and 27% respectively. Its fixed income portfolio has an average rating of “AA,” on par with the group, and an average duration of 4.1 years, the same as PRE and lower than Everest Re and Odyssey Re. XL’s ABS and non-agency MBS is slightly higher than the group as a percentage of book equity, at 77%, but lower than RenaissanceRe (RNR) and Endurance (ENH) as a percentage of total cash and investments. Its CMBS portfolio is now at $2.4 billion, after $800MM was sold in Q3, bringing it close to ACE’s $2.3 billion level. Its 10% decline in premiums written this year is about the same as for Everest and RenaissanceRe, and less than Berkshire’s 25% decline or ACE’s 22% drop in reinsurance premiums. Besides, sacrificing growth for pricing discipline is a virtue. Its combined ratio of 97.7% YTD is better than Everest (RE), Odyssey (ORH), Endurance and AIG, and about the same as AXS. None of this explains the 85%+ drop in XL’s share price this year. There must be more to the story…. Most of XL’s problems stem from the financial guaranty company, Syncora (SCA). Formerly known as Security Capital Assurance, Syncora was a subsidiary of XL Capital until XL brought its ownership below 50% through secondary market sales following Syncora’s 2006 IPO. Last year and earlier this year, XL Capital had a real mess on its hands because Syncora was facing serious issues with credit default swaps – very much like AIG – and XL Capital was on the hook for some of the risk. In addition to the Syncora issues, XL had it’s own challenges, including the integration of several acquired businesses, strengthening its enterprise risk management systems, and de-risking an investment portfolio that had become too heavily laden with mortgage-backed securities. In March of this year, XL announced that it was bringing in a new CEO, Mike McGavick, to turn things around. Mike had a great track record of success at CNA and at Safeco, which he substantially turned around in less than a year. A number of his moves at XL look like they come straight from his Safeco playbook: move quickly and get the financial pain out of the way; look to pay down debt through asset sales; invest in systems in order to wring efficiencies out of poorly-integrated acquired businesses, and ruthlessly drive down costs wherever possible. Mike’s most immediate challenge was Syncora. As the credit quality of the debt underlying Syncora’s credit default swaps eroded, it faced the same death spiral – ratings cuts, collateral calls, security sales, capital drain, ratings cuts, collateral calls… – that hobbled AIG. XL was only a minority owner of Syncora, but as of 6/30/08 still had exposure through guarantees and reinsurance to a whopping $65.7 billion net par value of pre-IPO contracts. Even though XL’s actual exposure under these contracts was estimated to be only $1.0-$1.5 billion, write-downs related to Syncora were damaging its financial statements – and its reputation. In July, Chubb was reported to have taken XL off of its approved list of markets for facultative reinsurance. S&P, Moody’s and Fitch all gave XL a negative outlook, citing its Syncora exposure. XL needed to get out from under the Syncora cloud fast (and Syncora needed cash), so on August 5th, XL paid $1.8 billion plus 8 million common shares to erase over 98% of this risk through a settlement agreement with Syncora and certain of its counterparties (XL also transferred its remaining Syncora shares to a trust for Syncora CDS counterparties). This payment was funded with part of the $2.9 billion in new preferred stock and equity units issued this year, so the company’s cash balance was still improved versus the beginning of the year. XL has put its Syncora exposure behind it, but it has been much harder for the company to undo the damage to its reputation. It didn’t help XL that at the same time that it announced the earnings hit for the Syncora settlement, it reported over $1 billion in mark-to-market losses on its fixed income portfolio. Most of the losses were non-cash – approximately $825MM was unrealized losses due primarily to increasing credit spreads. However, the combination of these charges was enough to trigger rumors that the company was on the brink of insolvency. These rumors prompted management to host its earnings call before its third quarter numbers were finalized, and to release detailed data on its portfolio. So far, investors seem unconvinced. What XL needs is more third party validation. A.M. Best upgraded its outlook from negative to stable following the Syncora settlement, and said that with McGavick at the helm, Syncora behind it, and its latest round of new capital, the company now has the resources befitting a strong insurance franchise. However, S&P, Fitch and Moody’s still have a negative outlook. Chubb has not, as far as I can tell, put XL back on its preferred insurer list. We expect XL to produce a strong, steady earnings stream from its ongoing core operations at a level equal to that of similarly rated peers, despite soft market pressures. An accident-year and calendar-year combined ratio of less than 100% and a pretax return on revenue (excluding realized gains or losses) of 15% will result from continued pricing discipline and operating performance, absent an unusually severe catastrophe year. Furthermore, financial leverage (debt plus preferreds including hybrids) will be no more than 40% of total capital when reflecting the February 2009 conversion of $745 million of senior notes into equity, and fixed-charge coverage (excluding noncash and unusual charges) will approach 5.5x in 2008 and 2009. It seems clear that S&P’s reluctance to lift its “negative” outlook is based more on XL’s history than its present status, and that barring any significant missteps, the outlook will be upgraded. However, it could take some time. S&P implies that it will need to monitor results for the next “couple of years” before changing its outlook. Since the Syncora settlement did little to help XL’s stock price, I dug deeper into the two other logical issues: the investment portfolio and the risk portfolio. S&P and A.M. Best both mention XL’s investment performance, and it is clear from my conversations with people in the industry that there are still concerns about what may be lurking in XL’s portfolio. I looked at XL’s Q3 credit supplement, which provides a substantial amount of detail on the portfolio, including marks versus par and amortized cost. I put together a summary of the data, which shows that fair values seem reasonable, especially when considering the true likelihood of nonpayment rather than temporary swings in treasury rates and credit spreads. XL has $1.3 billion of subprime, Alt-A and second lien loans; however, even the AAA-rated portion of this ($800MM) is carried at 75% of par. The A-rated portion ($300MM) is carried at only 41% of par. The combination of actual credit impairments and today’s insane credit spreads justifies these marks, but it is hard to imagine that 25% and 59%, respectively, of these loans actually will not be repaid. Its $758MM of non-ABS CDOs are carried at 64% of par. Its CMBS are marked at 88% of par, even though default rates for commercial mortgage-backed securities historically have averaged less than 1%. The only mark I question is carrying its $1.4 billion of consumer ABS at 99% of par. XL management has acknowledged the concerns about its portfolio and has already reduced its levels of riskier debt securities and equities. Overall, the portfolio has its issues, but nothing that would justify XL’s current stock price. One last thing I considered was XL’s exposure to D&O claims. About 24% of XL’s business is professional liability, and a recent study by Advisen Ltd. ranks XL as the third largest writer of D&O coverage for financial institutions, with an 11% market share. The rest of the top five are AIG (19%), Lloyds (17%), Chub (10%) and Travelers (6%). The study predicts that settlements and defense costs for subprime-related D&O claims will be $27 billion, of which the insured portion will be $5.9 billion. This would put XL’s share at $650 million, or 6.5% of book value. This is material, but, again, not enough to explain the current stock price. I spoke to some of my contacts in the industry to try and get to the bottom of this. They talked about XL having a lot of “those toxic subprime” securities in the portfolio, and XL’s having been involved in the whole credit default swap nightmare – nothing new. The good news was that I also heard that XL was “an important market” for them, and that they had not heard anything negative about XL lately. When I probed for details about XL, it became clear that nobody I spoke to had done any primary research. Their views were driven by industry chatter, which in this case seems to lag, not predict, reality. The time to make a negative call on XL was in late 2007 and the first half of 2008. 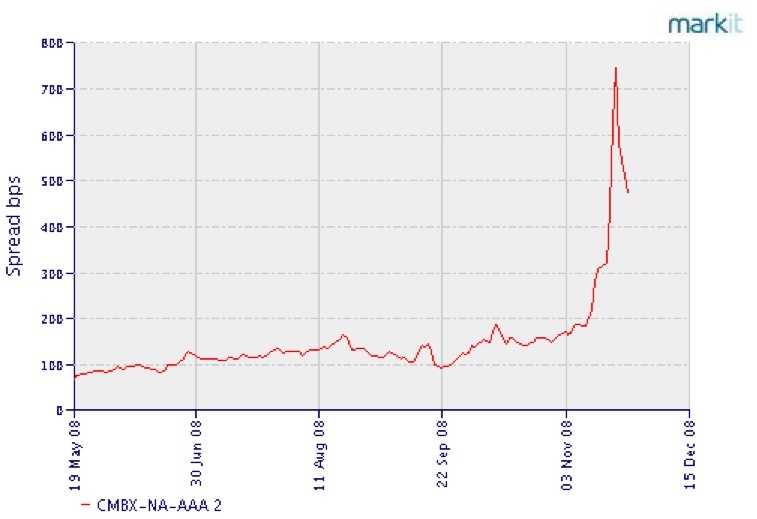 By the time the negative buzz reached its peak in October ’08, the vast majority of XL’s problems were already behind it. XL has raised new capital; virtually eliminated its Syncora problem; made progress in de-risking its investment portfolio (including the $800MM reduction in CMBS mentioned earlier, plus a $500MM reduction in corporate credits and other actions); and hired a new “Chief Enterprise Risk Officer” from Goldman Sachs. While XL is likely to have another significant round of mark-to-market losses in the fourth quarter, this will impact “comprehensive income” not net income. “Total Capital” refers to book equity plus minority interests, liquidation preference of preferred stock, and debt. “Capital” refers to “Total Capital” excluding accumulated other comprehensive income (“AOCI“). “Book” and “Book Value” refer to book common equity excluding AOCI. Prices are closing prices on 11/24/08. “Unlevered Value” is equity market value plus minority interest, preferred stock and debt, less an estimate of excess cash for RNR and VR. Premiums earned are for LTM ended 9/30/08. Company ratings are S&P financial strength ratings, or, if there is no FSR, ratings for the P&C operating companies. Validus rating is from A.M. Best. Portfolio average ratings are S&P except Everest, which is Moody’s. Figures for ORH are pro forma for an additional $150MM of share repurchases at an assumed $45/share average price. For AIG, figures: (1) are pro forma for the issuance of $40B Series D Pfd Stock and associated debt repayments, (2) do not include non-cash addition to APIC recorded with Series C Pfd Stock, (3) reflect preferred stock on an as-converted basis, and (4) include $156B of “other long-term borrowings” at face value, not $39.1B reported fair value.